Floating Aerating & Decorative Fountains From large ponds to lakes you'll find all decorative and aerating fountains here. Optional LED lighting packages are available. The perfect way to add superior oxygenation and aesthetic brilliance. Use these fountains in your pond, lake, decorative or industrial application. 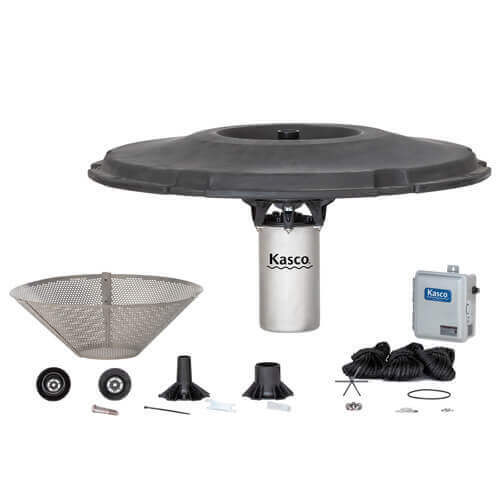 Kasco Floating Fountains deliver both superior oxygenation and aesthetic brilliance. Designed with clog-resistant technology, use these fountains in your pond, lake, or in decorative and industrial applications. Kasco decorative fountains are the perfect way to add class to any small or mid-size pond or lake. This versatile fountain comes with five interchangeable nozzle heads giving you the option to choose and change the spray pattern as you wish. Matala high-quality floating fountain can be used in ponds, lakes or retention ponds. The compact design houses a powerful pump that sits low in the water. Simply anchor the fountain and plug it in! An effective way to prevent or remedy this situation is by using a Scott fountain aerator, which discourages the formation of algae, adds oxygen to your water, promotes healthier fish, and improves the ecosystem. It clears murky, discolored water, too. You'll notice a difference in just a few days. And your Scott Aerator's rugged design will help maintain that difference over time. The elegant look and tranquil sound of a fountain's cascading water are exquisite additions to any pond or lakescape. Better yet, a Scott Aerator pond fountain not only beautifies your pond but also promotes a healthy aquatic environment through steady water circulation and oxygen transfer.